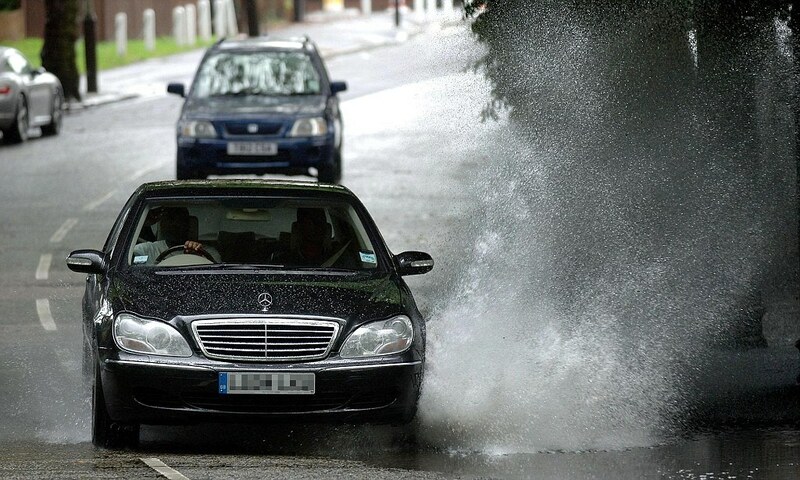 A £5000 fine for driving through a puddle..!! Most of the time we all enjoy the luxury of modern cars and think we are law abiding motorists. However, there are a few laws that certainly need some clarification. Even though in some cases they may seem absolutely insane, they nevertheless can attract fines and in some cases potential prison too. Here at Service Solutions we have prepared a list of some which you will hopefully find useful, and in some cases slightly amusing too. We hope this gives you a smile and also helps you to avoid any unnecessary fines…. 1. Firstly and quite incredibly, here is the potential punishment for driving through a puddle and splashing a pedestrian. As a pedestrian it’s very frustrating to be splashed by a car, it sometimes seems like they have no respect for anyone else on the road. 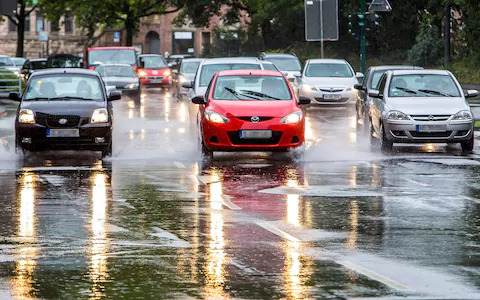 As a driver though it’s sometimes impossible to either stamp on the brakes or swerve into the road when presented with a curbside puddle. What you probably didn’t consider is that the pedestrian has the right to take down your registration and report you to the police. The behaviour could be considered as careless driving. This is punishable by a fine of up to £5000, or a possible 9 penalty points on your license. 2. During the winter months your car gets covered in road dirt, scum, and salt from the gritting. In a matter of hours a clean car can be caked in dirt. It’s actually an offence if the number plates are obscured at all. This is something that police are really cracking down on, especially due to the huge increase in cameras and ANPR machines. A 2 minute wipe off could help you to avoid a potential £1000 fine. 3. Eating at the wheel; lets face it many of us have done it. With the busy lives we lead it’s such an easy place to grab a bite. Leaving a service station with a coffee or your favourite chocolate bar, what’s the risk? If you are caught snacking the offence is most likely to be ‘driving a motor vehicle in a position which does not give proper control’. For offences such as these the punishment is up to £1000 fine, and 3 points on your licence. We don’t get much risk of the next one in this country but nevertheless as winter approaches we may see some snow. Driving with snow on the roof is often suspected to be an offence but specifically it isn’t. However if the snow slides down and causes any type of obstruction, either to your view or as a hazard to another driver then you risk the offence ‘driving without due consideration’ or even that you are ‘using a motor vehicle in a dangerous condition’. 4. Something which is very common and may come across as being helpful rather than an offence is flashing your lights at drivers with the intention of warning them about a hazard or a speed check. If the police consider that you’re doing the later, it can be found that you are ‘obstructing a constable in the execution of his duty’ this could leave you in the unenviable position of receiving a £1000 fine or even more worryingly a moth in prison. 5. If you own a camper van you will almost certainly be using it for impromptu nights away from home. Stopping after a long journey in a deserted lay-by or even the middle of the countryside for some wild camping is a scenario that thousands of owners find themselves doing. As with many of us, once set up camping it’s not unlikely that you will wind down for the day with some food and a glass of wine. Be aware though that you can be charged with drink driving without being in the driver’s seat, and without having the engine running. 6. When stationary in your car always make sure you have switched off your engine. This doesn’t come into play when you’re sitting in a traffic jam however whilst waiting for someone, or parked up to take a break it’s the law that the engine is switched off, not just a courtesy. Some modern cars do this as part of their usual driving routine but if yours doesn’t make sure you abide. The result of not doing so is an on the spot £20 fine. 7. Most of us pay special attention to our insurance, making sure we are covered and that the level of cover is what we are expecting. It is however not such common knowledge that if you lend your car to a friend or family member, as many of us do, that you need to be just as aware of their legality. It can be considered aiding and abetting if you lend your car to an uninsured driver. Punishment is not all that common but it does happen so be careful. Thanks for reading, do let us know if you have any questions or requests for future articles. Sources (saga magazine, express newspaper online, google) Oct 2017. Please note all information is given as a guide from our findings, please do your own research in regards to any legal points.